Step back a century and meet Cornell’s George F. Atkinson in this introduction by Torben Russo, Assistant Curator at the Cornell Plant Pathology Herbarium. On November 14th, 1918, Cornell’s first mycologist, George Francis Atkinson, preferring wind and rain over the comforts of home, died of pneumonia after collecting mushrooms near Mount Rainier in Washington State. At 64 years old he was one of the nation’s preeminent mycologists, working on what might have been his greatest work. His passion for collecting, photography, and research quickly and quietly evaporated at the height of his career. Mycophiles are a unique lot, often identifiable by the baskets they carry in the woods and a passion for certain edibles. G.F. Atkinson took his passion for mycology to another level. He certainly had an interest in edibles as his book Studies of American Fungi: Mushrooms, Edible, Poisonous, etc. implies. 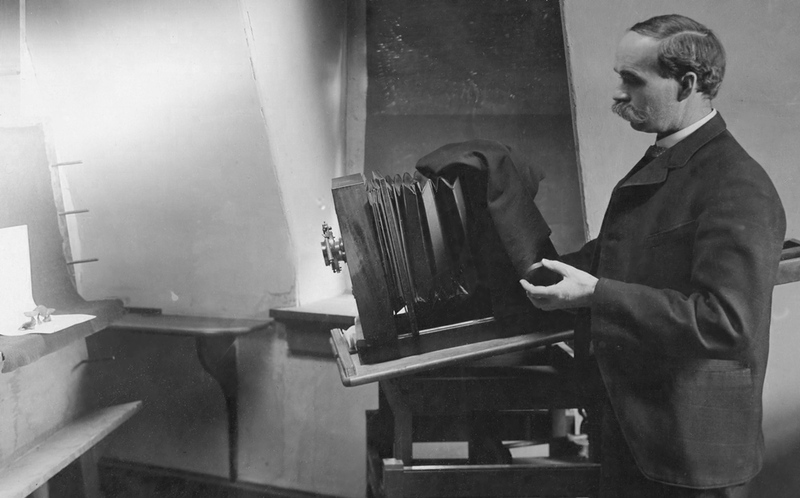 He was also a pioneer in mycological photography, and had a thirst for research. His unique focus, which led him to describe nearly 300 species and to accumulate over 90,000 specimens, leaves him with few peers. There are sparse clues to his mindset; little is known beyond Atkinson the mycologist. He ran away from home at the young age of 13, worked in the Black Hills of the Dakota Territories driving a stagecoach and fending off highway robbers, and worked a brief stint on a Mississippi river boat. He was a man forged of pure physical labor and stood just over six feet tall with large strong hands. Yet he was brilliant and, realizing he wanted more out of life, went back to school to make his way, putting physical labor behind him to pursue more intellectual endeavors. Atkinson was a student of Botany at Cornell and after graduating he kept to his nomadic ways, working in the southeast as he refined his interests. Studies in diseases of agricultural crops led to mycology, and the knowledge he brought back to Cornell as a well-rounded mycologist led to a new vision that influences how mycologists think today. Atkinson was a pioneer in mycology. He helped standardize the study and documentation of fungi at major collections in Europe and the U.S., produced nearly 200 published works, and, as a Cornell Professor, founded a major lineage of outstanding North American mycologists. * His award-winning photography was legendary and a key step in standardizing fungal taxonomy. He took photomicrographs and measurements of spores, and photographs of fruiting bodies in various stages of development. 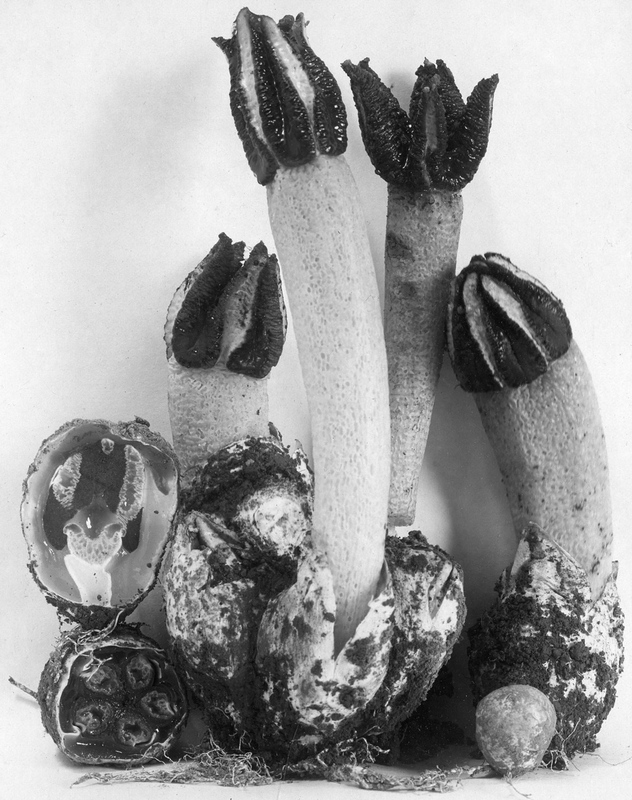 Some of the species he was the first to photograph and name include Amanita bisporigera, Amanita flavoconia and Stropharia hardii. Today Atkinson’s name is not well known, but his knowledge and contributions are “mycorrhizal” — woven within and about the roots of modern science and mycology, nourishing and helping mycologists and mycological understanding grow. Ninety years after Atkinson’s death, his collection was in trouble. The collection, held at the Cornell Plant Pathology Herbarium, had never been indexed. Acidic paper sleeves endangered his glass and nitrocellulose negatives; some specimens were housed in damaged packets; his field journals and notes were fading. Work to restore and digitize Atkinson’s collection started in Summer 2010 with support from the National Science Foundation. Two students were quickly hired to start entering data and scanning photographs. I was hired shortly thereafter to lead the project. To date we’ve employed over 20 students, and refined and streamlined our methods. Now, thousands of photographs and data for tens of thousands of specimens have been digitized in a bustling lab with five data-entry stations. With the help of CUP’s Curator Scott LaGreca, students are learning to spot which specimens need repair and how to do it. Data entry for fungi that Atkinson collected close to home in upstate New York is now complete, and roughly half of his other collections are finished. Thousands of Atkinson’s photographs are a work in progress. New sleeves and labels must be made for his ancient glass negatives, Atkinson’s notes will be digitized, and repairs are ongoing, but the students, our most valuable resource, are making great headway. Specimens, notes, and photographs will be linked in exciting new ways and our data will be made available online. By the end of the project we will have secured Atkinson’s legacy for future generations. Atkinson died before his time, without completing the great monographic series he planned on North American mushrooms. Still, he brought us new ways of looking at fungi, through the lens of a camera, through research papers, and through the generations of new mycologists he inspired. Thanks to the NSF and our hard-working team at CUP, Atkinson’s collections will be repaired, highly organized, and digitized. His data may help form a snapshot of mycological diversity 100 years ago, shedding light on the impacts of time and climate change on fungal populations. Atkinson may not have dreamed of his collection being used or shared in such a way, but given his spirit for discovery, I think he would have approved. * Atkinson’s founder’s role for generations of new mycologists can be seen in this “Genealogy of North American mycologists.” This and other lineages were assembled by our talented colleagues, Drs. Meredith Blackwell and Bob Gilbertson. Fitzpatrick, H.M. 1919. George Francis Atkinson. Science, N.S. 49(1268): 371-372. Korf, R.P. 1991. An historical perspective: Mycology in the Departments of Botany and of Plant Pathology at Cornell University and the Geneva Agricultural Experiment Station. Mycotaxon 40: 107-128. Thom, C. 1956. George Francis Atkinson, 1854–1918. Biographical Memoirs, National Academy of Sciences, pp. 17-44. Material from the Atkinson Archive at Kroch Library, Cornell University. Material and feature images from the Atkinson Collection at the Cornell Plant Pathology Herbarium, Cornell University. Thanks to Kathie Hodge, Robert Dirig, and Scott LaGreca for being great editors and helpful friends throughout the writing process, thanks to all the students who have worked tirelessly to make this a productive project, thanks to Ed Cobb for digging up random facts on Atkinson that otherwise might have been overlooked, and thanks to all the mycophiles who make this blog possible! We are grateful to the National Science Foundation (DBI 0954682) for their support of this work. I am always fascinated to learn of how much information exists in a state of isolation or deterioration, with 95% of the work to collect it already done, but he last 5% to preserve and catalog it often elusive. A mycologist who was part of the etymology of the term “riding shotgun.” What a great story. Thanks for the profile in such a fascinating figure. I’m not a mycologist, but I find your blog and posts fascinating. What a well written account about a fascinating man. Must be nice to be involved in such a legacy. I’m glad to have helped start this project off. You really have a beautiful way with words. I wish I were still eligible to help out and see this project through to completion! I had the great pleasure of working on this project for about 8 months. Some might think that data entry for a project like this would be monotonous. However, as I entered data, the samples and their notes brought George Atkinson and his colleagues to life. A romantic at heart, I would like to imagine their mycological excursions and could picture them collecting in places like Blowing Rock, NC, Ithaca, NY and Washington State a century ago. I felt like a detective trying to decipher George’s notoriously bad handwriting tracking down locations of where samples were collected, determining genus and species names and puzzling over why he would sample a mushroom that had never been identified before. I think my greatest joy though was the hours I spent scanning George’s photos. In my mind they are art. It was such a great pleasure to contribute to this project and I think it is a truly important legacy. A great synopsis of an amazing man and pioneering mycologist. Boy, he sure didn’t mind getting HIS hands dirty! Glad that I didn’t have to carry THAT camera around with me in the field, but what amazing photos resulted. How wonderful that you are honoring his tireless and timeless work in such a profound and important way…making it available to future generations. From the left coast and across our great continent, I salute you all! Great story and inspiring on so many levels.